An illustrated talk presented by Michael Dempsey and Glascott Symes in celebration of National Heritage Week. Wednesday 6th September at 7.30p.m. Riverbank Arts Centre, Newbridge by courtesy of Kildare County Council. This is the 2nd seminar organised by the County Kildare Archaeological Society and the Local Studies Dept. of Kildare County Library and Arts Service. Details of a talk by Michael Dempsey and Glascott Symes to be given to mark National Heritage Week. "THE LAMENT OF BRAER HARE." And hope you’ll give my protest the display that it deserves. And never have been forced to write to the Public Press before. For evermore from Newbridge fields and sought out pastures new. And writing indiscreetly of the vagaries of the hares. Appeared in your own columns, and made obvious demand. On someone to explain why we so slowly "came to hand." To lecture us in tactics, or excuse from us require. To Pressmen who, by prose or verse, our private rights impeach. But found conditions far from being like on our native heath. Hence I have now decided, as suffice is our protest. To recall all to Newbridge fields for coursing at its best. And Tommy need no longer dread our absence on his "Beats,"
They’ll have the running of the Cup in Nineteen Thirty Eight. I hope-nay crave- that "Spadah" will not write me up as "weak." Hermann Geissel gives an absorbing account of his attempt to trace and map out the Slí Mhór on the Esker Riada. This ancient routeway, extending from the Áth Cliath Cualann hurdle ford that gave Dublin its Irish name, to the Áth Cliath Maree at the mouth of the Clarin River on Galway Bay, formerly linked East and West while dividing the island into two similar halves. The results of this research were first presented as An tSlí Mhór, a six-part television documentary on TG4, and since then the investigation has been revised and expanded into the present account. The outcome is a fascinating story of a personal odyssey undertaken by the author, together with historian Seamus Cullen, lavishly illustrated with striking photographs and equipped with helpful maps and informative appendices. Anecdotal humour and scholarly references sit together easily in the text, providing an enthralling and enlightening story of a little-known aspect of our medieval heritage. Hermann Geissel’s most recent work merits serious consideration and the highest praise from all interested in Irish archaeology, history, geography, geology and landscape related studies. He has provided us with a learned and detailed trail across the centre of Ireland … filled with scholarly and often amusing anecdotes … copiously and intelligently illustrated throughout… of post-graduate thesis standard. [Research that] most of us feel should have been done years ago. [Mr Geissel] has supported his argument with maps, photographs and detailed descriptions, all of which are written in an accessible and easy to read manner. I have no doubt that his work will stimulate debate and further study. It will expand interest in the landscape of the midlands and will help to make local communities more aware of their heritage. For Herman Geissel the landscape is permeated with the physical traces and invisible echoes of the Great Road along the eskers. In this absorbing piece of topographical detective work he conjures up and re-creates the ancient roadway from traces and whispers that live on in our everyday landscape, connecting the places where it still survives as a major cultural fault line. Ancient Ireland’s most important trade and pilgrimage route is brought to life by a knowledgeable, humorous and gently informative tour guide. There is an anecdote and an astute observation for every turn. You will never look at a road the same way again. 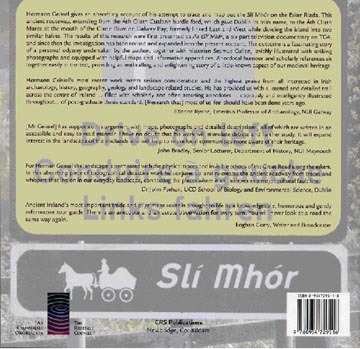 Hermann Geissel (well-known to all in local history circles in Co. Kildare) has a new book coming out on the Slí Mhór. It will be launched in 3 different venues during Heritage Week. SIGNAL TOWERS, HERITAGE WEEK AND MORE! Signal Towers, National Heritage Week and More! We Kildare historians sometimes miss out on the maritime aspects of Ireland's tapestry of local history but any of you heading for the coast this month might like to keep an eye for the following. Many of our headlands have signal towers built just on 200 years ago (1804-06) to warn of a potential Napoleonic invasion. The enterprising folk in Beara tourism hit on the idea of getting local communities to stage a bonfire event at their local tower. Since mid July towers have been lit around the coast in a relay type arrangment. On the afternoon of 20 August it is hoped that all or most of these towers will again host a bonfire or similar event, marking the 200th anniversary of their commissioning. If you are heading for the coast -- or even if you are not -- there is a very informative website at www.signaltowersireland.com which gives much information on what is happening and some history of these forgotten coastal sentinels. Just an advance 'heads up' re Heritage week 2006. There is a very good website put up by the Heritage Council, namely www.heritageweek.ie where the full listing is searchable by county. It is encouraging to see that there are new and novel events and locations featuring this year with Dublin city and county having a particularly interesting availability. There are a number of 1916-themed walks in the city while the OPW are also offering some interesting tours. For example the Magazine Fort in the Phoenix Park which has never been open before but which made headlines in 1916 and again in 1940 features on one walk. Also the underwritten Richmond Barracks in Inchicore is the topic of a talk in Kilmainham. A tour of residences in Merrion Square has attractions as does a free trip on the Dublin Docklands new cruise boat viewing the city from a riverborne context. And if all that is too serious on the history agenda, out in Dun Laoghaire-Rathdown there is a talk on the history of HB icecream -- a product which probably had a greater impact in Irish social history than all of the rebellions, wars and emergencies put together! PS1: for the first time in a long time the Naas Local History Group has made it on tothe Heritage Week programme with a dramatised reading of the story of the county town in the atmospheric surrounds of Naas Town Hall at 8pm on 31 August. PS2: a special mention for Nick Coy's heritage week walk at the Avoca mines, Nick has been running this since the very first heritage week many years ago. Liam Kenny explores some of the up and coming events which should be of interest to anyone with an interest in heritage and local history. HEAR . LIETH . INTOMBED . THE . BODY . OF . QUIRE . WHO . DECEASED . THE . LAST . OF . DECEMBER . IN . ANNO . DOMINI. 1616 . BEINGE . OF . THE . ADGE . OF . XXVII . YEARS . On the front of the tomb six human figures are represented, three males and three females. The former to the left-and over each are the initials of their names: N.W., I.W., W.W., E.W., M.W., I.W. Another stone, with elaborately carved armorial bearings, and bearing the date 1716, is (now) placed over the older inscription already given. More details concerning this family will be given later on. A.D. 1346. A Provincial Chapter of the Order was held here. (Id) Clyn, (Annales), says that a general chapter was held here in 1345; wherein it was ordained that the Franciscan Monasteries of Kilkenny and Ross should be assigned to the wardenship of Dublin. It appears probable that these two entries refer to the same assemblage. Archdall states that the Seal of this Convent was in being at the beginning of the 17th century, on which was the following inscription: Sigill. Coiatis, Frum. Minor. de Clane.-Hortus Angelorum. The sites of three Mass-houses all built since 1714-two of which were thatched edifices-are pointed out at Clane; one lately disused, bears the date, 1805. A stately and beautiful Gothic Church, designed by Mr. W. Hague, has just been completed at an outlay of some £7,000, through the zealous exertions of the present Pastor, the Rev. Patk. Turner. There is a Well, reputed Holy, called Sunday Well, on the W. side of the Liffey, beside the moat or Tumulus already referred to. A Patron and Stations used to be held at it within the memory of some still living. It is not unlikely that St. Patrick blessed this well, and used it in baptizing his converts, when he passed here on his way to Naas. The earthen Rampart of the Pale may still be traced, for the length of about a mile, between Clane and Clongoweswood College, and again, in the parish of Kilcock. In the Litany of St. Aengus, Ceile De, “the seven holy Bishops of Drom Airchaille,” are invoked. These seven Bishops, according to McFirbis, were descended from Conal, the grandson of Cairbre Niager, King of Leinster. The Annals of the Four Masters have the following entry:-“A.D. 837. Domhnall, son of Aedh, Abbot of Druim Urchailli died.” The name of this place signifies the Ridge of the Greenwood. The foundation of the Church which stood here may still be traced in what was formerly called the Foxcover field, now planted, and also an ancient road leading from it, now meeting the modern road at Dunadea demesne wall. Donmorchill was a Prebend of the Diocese of Kildare, and in the taxation, temp. Hen. VIII., is valued at 6s. The original Church of this locality was probably founded by St. Mochatoc of Inisfail, one of the seven companions whom St. Patrick left with St. Fiacc of Sletty after his consecration. This Saint is referred to in the Trias. Th. as St. Patrick;s Chaplain. The Martyrology of Donegal gives his feast at Dec. 12th. He died about the close of the fifth century; his relics were preserved in Inisfail, in Wexford Harbour, until the year 819, when, in consequence of the incursions of the Danes, and to preserve them from desecration, they were removed to the Church of Sletty. (Loca Patr. P. 225.) In Dr. MacGeoghegan’s List, Dunadea is called the Church of St. Peter; the ruins of the old church, and the cemetery, still used, are situate within the demesne, and close to the Castle of Dunadea. The inscription on the Alymer tomb, which formerly stood in this Church, and has been removed to the modern Protestant Church adjoining, gives the year 1626 as the date of its erection, but the portion of the ruin still standing would indicate a greater antiquity. Dunadea was a Prebend of the Diocese of Kildare, and is valued at £2 in the taxation of Henry VIII. The Aylmer tomb is in the shape of an altar and reredos. At one end is sculptured the Crucifixion, and at the other, the Blessed Virgin; on the front are figures representing the four Doctors of the Church. On the reredos are kneeling effigies of Sir Gerald Aylmer and his lady, with their children. The following is the inscription: “Pray for the soule of Dame Julia Nugent, daughter to Sir Christopher Nugent, 1˚ Baron of Delvin, and wife of Sir Christopher Aylmer, Knight and Baronet, by whom he had issue Andrew and Julia Aylmer. She deceased the 10 of November, Ann. Dom. 1617. “This Monument was removed from the old Church Nov. 1812, by Sir Fenton Aylmer, Bart. Dunadea Castle, the seat of the Aylmers, is an ancient castellated pile with some modern additions; it has no pretension to architectural beauty. It sustained a siege in 1691, when the wife of Sir Andrew Aylmer displayed much bravery in its defence. The Baronetcy, which is in a younger branch of the family, was created in 1621. The Aylmers of Dunadea were staunch Catholics until the commencement of the last century, when the faith was iniquitously and dishonourably filched from them by the Court of Wards, a branch of the Court of Chancery. In the same way Protestantism had been introduced into the Ducal House of Leinster a century previous. Sir Fitzgerald Aylmer, the 4th Bart., married, in June 1681, Lady Helen Plunkett, daughter of the Earl of Fingall, and, dying of the small-pox, 11 June 1685, was succeeded by his son, Sir Justin, then but three years old. He was left under the guardianship of his mother, who took him and his brother into France for their education, where they remained during the troubles of King James’s reign; notwithstanding which, she and they were outlawed for high treason, but, on her petition, the outlawry was reversed. In 1702, Sir Justin married Ellice, daughter of Sir Gerald Aylmer, of Balrath, Bart., and died in 1711, leaving two sons, Sir Gerald and Peter Justin, who, having been handed over by the Court of Wards to the custody of Matthew, Lord Aylmer, a Protestant, were, by him, reared in that religion. Dunadea Castle was a place of refuge for the Bishops and Priests of the Diocese of Kildare during the times of persecution. Of the P.P.s registered in 1704, three are stated to have been ordained in 1680, by Dr. Mark Forstall, Bishop of Kildare, at Dunadea. These ordinations probably took place in the Chapel of the Castle. “This Castle was made by Piers FitzGerald of Ballysonan and Elinor FitzGerald his wife, this 20 of August, 1584.” Underneath is a Shield with a St. Andrew’s Cross as a device. By an Inquisition, taken at Naas, 13th. Octr. 1637, it appears that this Piers FitzGerald died the 17th March, 1593, leaving James his son and heir; this latter died 24th April, 1637, and was succeeded by his relative, Piers FitzGerald, then 27 years of age, and married. Another Inquisition, also taken at Naas, 30th Decr., 1663, shows that the “townes and lands of Blackwood, Courtduffe, and Coolecorgan, 790 acres, and Geidenstowne, 297 acres, were, on the 23rd Octr., 1641, in the possession of Pierce FitzGerald of Ballyshannon, in the Co. Kildare, Esq., who, in Easter tearme in the 18th yeare of the raigne of Charles I., was indicted and outlawed of high treason, whereby all the premises aforesaid became forfeited to the sayd King, and are now in the hands of Lisly Dungan, widow, by a decree of the Courte of Claymes.” Pierce FitzGerald was a member of the Supreme Council of the Confederate Catholics which assembled at Kilkenny on the 10th of January, 1647. Whose essay was to free a captive Queen. “Many documents,” Mr Gilbert observes, “connected with the Princess Clementina Sobieski and her escape, are extant among the Imperial Archives at Vienna and Innspruck. In recognition of their services on this occasion, a diploma of citizenship of Rome was conferred on Wogan and his three companions. This honour of Roman citizenship, it is stated, had not for many centuries been conceded to any foreigner in Italy. Sir Charles Wogan was the author of productions in Latin, French, and English, and some letters passed between him and Dean Swift. Four pages from the elegantly-executed official diploma of citizenship above referred to, have been reproduced in the Facsimiles of National MSS. of Ireland, Plate C.
Archibald Hamilton Rowan purchased the manor of Rathcoffey from Richard Wogan Talbot of Malahide, and built upon it the present mansion, having levelled, with the exception of an ancient gateway, the old castellated and fortified pile which had long been the residence of the Wogan family. This castle was captured in 1642 by Colonel Monk, afterwards Duke of Albemarle, on which occasion he made seventy prisoners, most of whom were executed in Dublin as rebels. (Gazetteer of Ireland). In the list of the Council of the Confederate Catholics assembled at Kilkenny, in January, 1647, the name of “Nicholas Wogan of Rathcoffey,” appears. Rev. Mr. Daniel’s Return mentioned that “there was a private chapel at the house of Mr. Browne, at Castle Browne.” On the restoration of the Society, in 1814, the Jesuits purchased this place, and it is now the great educational establishment known as Clongoweswood College, the Fathers having given it back its previous name. The old parochial Church here was dedicated to the Blessed Virgin; it is entered in Dr. MacGeoghegan’s list as “Ecclesia Sanctae Mariae de Ballynaffaghy.” The present Protestant Church occupies the site of the old Church, a small portion of the walls of which latter is still standing, to the east end. The site of this Church is marked by a grave-yard, in which some of the walls of the Church remain, but are quite featureless. This Church, as we learn from the list of Dr. MacGeoghegan, was dedicated to St. Kynog:-“Ecclesia Sti. Kynogi de Tymochuo,” though its name_Tech-Mochuo, “Mochuo’s house,” would imply a connection with another Saint. ANDREW ENNIS appears to have been the next P.P. The inscription at the ruins of the Franciscan Monastery at Clane, already quoted, refers to him as the Parish Priest in 1738. THE VERY REV. WILLIAM DUNNE, V.G., is the next Pastor of whom we have an account. It does not appear when Father Ennis died and Dr. Dunne succeeded. The latter died in the year 1793. REV. JOHN DUNNE succeeded; he died in 1797. REV. JOHN LALOR was, probably, P.P. after Fr. John Dunne; he became Parish Priest of Allen on the death of Dean William Lalor, in 1802. REV. MARK KENNEDY, who died, August 26th, 1821, and was interred at Mainham. REV. MALACHY MCMAHON was the succeeding Pastor. He was P.P. of Suncroft, but consented to take charge of this parish at the request of Dr. Doyle, chiefly with a view of putting down Ribbonism, then rife in this neighbourhood. In a letter written to a personal friend, during his visitation in May, 1823, Dr. Doyle thus refers to Father McMahon:- “I came last night to the house of Rev. Mr. McMahon,- a splendid mansion, bestowed on him by Dean Digby, of the Established Church. After Mass I set out on my mission, to a district which no Bishop had visited perhaps for a century before. The inhabitants had been rude, wild, and intractable, but this good little man had gone amongst them without scrip, or coat, or money in his purse, and formed them into a new people, like the primitive Christians.” –Life of J.K.L.,p.242, 2nd Edn. Vol.II. Having accomplished the object of his mission, Fr. McMahon returned to Suncroft, where he died, Feb. 18th, 1868, aged 108. REV. MAURICE KEARNEY was appointed P.P. on the retirement of Father McMahon, in 1824. He died, October 19th, 1842, and was interred in the parish Chapel at Clane. By his will he left a large sum,-accumulated chiefly through successful traffic in cattle-dealing,-to Carlow College, for the education of priests for the foreign missions. REV. EDWARD CONROY, previously Administrator of Carlow, succeeded to the parish, on the death of Father Kearney. He died, December 15th, 1872, and has for his successor the present zealous Pastor, the REV. PATRICK TURNER, translated thither from the parish of Rhode. In light of the recent discoveries and the renewed interest in Bog-Finds of an archaeological nature, particularly those of an Iron Age date, which have done much to add to our understanding of the Iron Age period it is worth re-considering our own Bog-Finds, from the County of Kildare. Containing, as it does large tracts of bog, most notably the famous Bog of Allen, it is not surprising that over the years a great variety of bog-finds have materialised, in various states of preservation. A simple examination of the records in the National Museum of Ireland reveal the extent of the Archaeological Heritage which the bogs have preserved for us. The earliest bog-find on record dates to 1929, with the discovery of Bog Butter in the townland of Killinagh, in the Barony of Carbury. Bog butter is, of course among the most common type of artefact found in Bogs and without further analysis it is impossible to place within any particular context as it is possibly of iron age in date, but it is also just as possible that it belongs to a Medieval or post-medieval context. Finds of Bog butter were also recorded at Clogorrow, Barony of Narragh and West Rheban in 1947 and at the Blackwater, near Rathangan in1953. The discovery of bog-butter has continued right up to recent times with the discovery of bog butter and a wickerwork container in a bog at Newtownbert, Barony of Narragh and West Rheban in 1967 and a wooden vessel and bog butter at Rosberry, Barony of Connell in 1970. In 1986 Bog butter was found at Scarletstown in the Barony of Connell and in the 90’s two finds are also recorded, another at Rosberry in 1993 and one in the Knockcor area in the barony of Carbury. According to Eamonn P. Kelly, Keeper of Irish Antiquities, NMI (1) in the current edition of Archaeology Ireland,bog burials involving human sacrifice in the early IronAge can now be seen to be part of a wider practice ofritual deposition in which offerings of bog butter, quernstones, etc. also play a part. Dr. Kelly suggests that (2006:28)"These are reminders that a central function of themarriage of the king and the earth goddess was to ensurethe fertility of the land and the wellbeing of the peoplewho were dependent for survival on reliable yields of corn,milk and milk products.” His study, which also suggests the importance of peripheral or boundary locations found that nine samples of Irish Iron Age bog butter were all found onor in close proximity to boundaries, five near baronyboundaries and three near parish boundaries. One very interesting example, which would seem to support his theory is that of Clongownagh Bog, in the townland of Baronstown West, Barony of Connell wherein 1954 “one of the samples of bog butter wasfound in the same bog as an Irish Iron Age bog body”. As far back as the 40’s those working in the bogs of county Kildare frequently reported their finds to the National Museum. In 1947, several other finds were also reported. At Clonkeeran, in the Barony of Carbury a section of a bog road was uncovered, while at Mucklon, also in the Barony of Carbury a leather shoe and wooden vessel were found, and at Derries bog wooden discs and bones were uncovered. Bog roads, or trackways, such as that at Clonkeeran are also a common discovery in Kildare, and indeed all over the midlands and other areas which contain large areas of peatland. According to the Irish Peatland Conservation Council (2) over 200 track ways have been found in Irish bogs and are common in Counties Kildare, Leitrim, Galway, Longford, Meath, Offaly, Tipperary and Westmeath. Those in Kildare include one atClonegath in the Townland of Oghil, which also included the discovery of quernstones, and others at Cloncarlin(Td. Oghil), Timahoe, and Lullymore all in the sixties. Another, in this case a stone-paved road was uncovered at Rathbride in 1974 and one at Drehid in 1985. In some cases the records are particularly poor, such as that of a Wooden object at Timahoe in 1950 and similarly at Tankardstown in 1953. Whether the nature of these objects was apparent or not is unclear, however the records seems to suggest they were un-identifiable. There are also the existence of several finds which suggest activity in earlier periods than that usually associated with the bog-lands. Finds such as a stone axe-head from Cloncarlin Bog, another from Dawson’s bog, Oldtowndonore, a flint arrowhead from Timahoe West are all perhaps indicators of Neolithic activity in the bogs. Leather objects are also occasionally found preserved in bogs, due to the nature of the soil, such as a leather shoe found in a sack of turf, believed to have originated at Timahoe, in the Barony of Clane, another at Ticknevin, in the Barony of Carbury, three found at Ballindoolin, also in the Barony of Carbury and another more recently, in 2001 the discovery of a leather belt in a bog in the County. Several Bronze objects have also turned up over the years, including a bronze dirk found in a bog at Rosberry in 1981, a drinking vessel, found in Derrylea Bog, Quinsborough and a Bronze sword blade found at Lullymore Bog in 1999. Other various discoveries include a possible Togher at Lattensbog, Human/Human Bones from Timahoe bog, a wooden object from Mulgeeth, wooden spade from Timarve, Bones at Donaghdea, worked timbers from a bog at Killenagh, and various other finds from Lullymore. Admittedly many of the older finds were not susceptible to the levels of examination possible now, and one is forced to consider what information has been lost from these finds forever. However, it is also clear that much is still to be learned from an analysis of these objects. While this article simply outlines the wealth of the bog-finds originating in this county, it also opens our eyes to the possibilities of further research. Perhaps a study of the find-spots of these artefacts would prove useful in supporting or questioning the recent theory regarding the boundary locations of ritual deposits suggested by Ned Kelly. It is also possible that careful re-examination of these finds would add to our understanding of areas of inhabitation, important territorial boundaries and the artefacts associated with ritual deposition in particular areas. An outline of finds from the bogs of County Kildare as detailed in the National Museum of Ireland records. Now that there is so much to say about the Irish Industrial Movement, we would call attention to what has been quietly done and is doing in the little town of Monasterevan. A few years ago, through the persistent efforts of Mrs. Wheeble (who takes an active and generous interest in all Irish industries), a lace class was established in Monasterevan. The result is that there are to-day no less than 30 workers constantly engaged, all of them receiving substantial remuneration for their work. That the girls are first-class workers may be judged from the fact that at the recent show held in Athy they gained first and other prizes, Miss B. Dunne receiving a first prize, Miss M. O’Kelly a second prize, and Miss L. O’Kelly a commended. Besides this very creditable showing, all the work exhibited at the show by the Monasterevan Lace Class quickly found purchasers. Those in a position to give an opinion on the subject confidently assert that for beauty and excellence of finish the Monasterevan work compares favourably with anything produced in Ireland. This speaks well for Miss Bride O’Neill, the teacher, who is herself home-trained, and who spares no pains to make her pupils first-class workers. All this must be very pleasing to Mrs. Wheeble, who has spared neither trouble or expense to gain this most desired result. She has devoted much of her time to the class, and watched over it with a mother’s care, and it is mainly through her efforts that the very satisfactory results have been achieved. On the 15th August Mrs. Wheeble provided a most enjoyable day’s outing to all of the lace workers by sending them to the show and providing for the comforts of all, free of expense. THE KILDARE HOUNDS - A Chapter from B.M. Fitzpatrick's "Irish Sport and Sportsmen"
The “Killing” Kildare premier pack, &c., are phrases which hunting men are used to apply as naturally as young men and maidens, the slaves of Cupid, do “Duck,” “Dear,” or “Darling.” And well these hounds merit the flattering designation: assuredly, taking this sea-girth isle as the boundary, the pack is not inferior to any. It may well be compared with any in the kingdom; and the country over which they hunt is, in a fox-hunting sense, the “cream” of all Ireland. Some years before Squire Connolly’s death, the pack was kept at Bishopscourt, though he was the recognised master; when he died in 1804, Sir Fenton Aylmer succeeded him, and kept the hounds for a year or two; and then Mr. Arthur Henry took them, and kept them till 1810, when Sir Fenton Aylmer resumed the mastership. He had a very famous huntsman, Jack Grennon, gifted with a grand voice; a first-rate rider, but like all of us, he had his faults, and one of them was being too hasty to please the hunting men of his time, though, I dare say, his manner would be considered not unbecoming in these more democratic days. The whips, Will Mathews and his son, were men who subsequently acquired a great reputation. In 1813, an accident occurred which destroyed the best hounds in the kennel. The meet was at Tipper cross-roads, near Naas; a fox was found in Forenaughts, and a grand run ensued to Poulaphouca, beloved of pic-nicers. Just near the spot where the bridge now stands Reynard plunged into the rushing torrent, thirteen couple of the pack followed suits, there was a strong “freshet” in the Liffey at the time, and they were all drowned. I have gained much information from a very interesting MS. from the Johnstown-Kennedy library; and this will be an appropriate places for me to offer my very sincere thanks to Sir Edward Kennedy for his kindness in allowing me to inspect them, and to assure my readers that, without that kind indulgence, they, and I, must have remained in ignorance of what I consider the most important epoch in the formation of the Kildare hounds. Sit John Kennedy kept a diary of not only every run, but what is an even more pleasant reminiscence, the names of those who shared the sport with him. It would be well if the gentlemen of the present day followed his example in this respect: the records would be read with interest by a “generation yet unborn.” One likes to see the names of parents, relatives, or friends recorded in such old archives-they recall scenes to memory dear. Indeed, it was thinking on this subject that first put the idea into my head of writing this volume. The history of the different packs must of necessity be a matter of dry and simple detail; but sporting readers are not inclined to be critical, so long as they perceive the vi vida vis, the fervidus, afflatus in works such as “Irish Sport and Sportsmen.” Such records, I opine, afford pleasure and recreation to many. If it be pleasant to peruse works which revive in our minds past enjoyments, shared in when “our lines were cast in pleasant places,” ‘tis especially so in the evening of our lives, when our sun has almost set, and when we by anticipation feel the chill touch of the “wooden surtout,” or hear the final inevitable summons. Though our fate during our struggle in this vale of tears may have been unpropitious, though the links that bound us to the “old house at home”, may have been shattered, and the well-knit bonds of friendship which allied us to those most dear may have been severed, memory paints the past with a consoling, though, perhaps, fictitious splendour, and any record which aids it is of use. In the manuscripts alluded to I found the names of the first supporters of the Kildare Hunt. They were, in 1806, Mr. John Farrell; in 1837, Messrs. Robert Archbold, Arthur Henry, Joseph Connolly, and Val Maher; in 1809, Sir (then Mr.) John Kennedy; in 1811, Lord William Fitzgerald, Lord Henry Moore (Lord Drogheda’s fathyer), and the Duke of Leinster; in 1815, Lord Portarlington; in 1825, Mr. Richard More O’Ferrall, and Lord Howth; in 1836, the brothers John and Robert La Touche. At a meeting held in Morrisson’s Hotel, then called Morrisson’s Tavern, on the 10th of October, 1814, it appears that Sir John Kennedy offered to take the hounds, provided that the members would guarantee him £500 per annum, to enable him to defray the expenses of keeping the coverts, paying for fowl, &c. The offer was gladly accepted. The baronet was, facile princeps, in every branch of knowledge essential to good mastership, and he spared no expense. He used to hunt his hounds five days a fortnight and the country extended as far as Oakley Park, in Carlow, and Loughcrew, in the county Meath. Of course the custom at that time was to be out at dawn of day. Jigginstown, where the kennels now stand, was a very favourite tryst, and many an ardent sportsman, who now lies “mouldering in the grave,” spent hours there on a wild winter’s morning seeking shelter beneath the ruins of the unfortunate Earl of Strafford’s intended palace, awaiting the return of the “varmit” to these favourite earths. The men of those days were men of “metal,” so to speak, far different, alas! from the not effeminate though more polished and as ardent sportsmen of to-day. The habitués of the hunting field, of late years, may have often seen, when standing on the hill which overhangs that magnificent piece of gorse known as Elverstown Coevert, John Nolan, a man who has catered to the wants of the fox family-bless their brushes-for years past. Well, his father was earthwarmer during Sir John’s time, and he frequently received his instruction from him in Johnstown-Kennedy on a winter’s evening, walked to Loughcrew, stopped the earths there, and returned to Elverstown, doing the long journey and his business within the twenty-four hours. There were not giants in those days; but there were many men of slender mould made of sterner stuff than those of the present generation. The Club was very much in debt in 1814, the sum total of the liabilities having amounted to no less than £2,400. The foxes were more numerous then than now. The runs were generally longer too; the gentry did all in their power to preserve foxes. They appear to have managed all the affairs relative to the hunting of the country in the most systematic manner, and the wording of many of the resolutions passed at their meetings would amuse had I space to quote them. For instance, at a meeting held in Naas, during Sir John Kennedy’s mastership, we find that the following resolution was passed and forwarded to Mr. Digby of Landenstown. He seldom used a horn. The Rev. Robert Burrowes was secretary during his reign; he had a passion for hunting. I have heard a gentleman state that he never knew a more ardent fox-hunter; and, he added, “he spent his days either in the saddle, or on his knees at the earths, going throughout the country.” When asked to explain the answer my informant …was, that when the parson was not riding, he usually spent his time going from one likely fox-refuge to another; and when he came to an earth, or a hole where he suspected one of the “artful dodgers” might be, he used to throw himself on his hands and knees in his anxiety to track him. Many noted hard riders hunted in Kildare at this period, and it was a rare treat to see Sir John Kennedy on his notable white horse, Gamecock; Robin Aylmer, of Painstown, on his black stallion, Rununculus, a brilliant performer, but very savage brute; Sir Philip Crampton and “Parson” Burrowes, leading the pair over an intricate county. There was a curious character, Sugu by name, one of the Mickey Free type, who used to follow the hounds on foot in those days. One day he happened to be standing on the banks of the well-known Laragh river, when, near the end of a great run, the pack crossed the stream; at this time “the good and the true ones” were far in front, the field being scattered like the tail of a comet. The leading two jumped a very wide place, and the first over was Sir John. “More power, yer honour; yer a chip of the real good ould blcok; may ye live for ever,” exclaimed Sugu. The next over was Robin Aylmer. “Bravo Squire; sweet Painstown, and an Irish sky above it; musha the devil himself couldn’t “hould” you.” Then came Sir Philip Crampton. “Well done, Dr. Phil; may I never die till you cut a leg o’ me,” exclaimed the enthusiastic rustic. The members of the Kildare Hunt Club used not to confine their hunting manoeuvres to the home circuit either. They frequently spent a week or so together at a hotel in a good hunting country, and during those festive gatherings the fun of the chase was only exceeded by the hilarity of the after dinner time, when the majority of the company were Bacchi plenus before being conveyed to bed. En passant, I may remark that they had a very beautiful service of plate, which was afterwards sold to discharge some of the debts, and this they always brought with them during these excursions. Such was then the custom, and right merry meeting these festive reunions were. About this time the Benson’s Club was in existence, and the members used to bring a pack of hounds with them to Castlepollard, county Westmeath, annually, and during a month’s sojourn there the fun and dissipation were something wonderful. Colonel Lennox, afterwards Duke of Richmond, a notorious bon vivant, having heard of the bibulous capacity of the members of “Benson’s” sent a challenge, which was accepted. The test of endurance between the contending parties was, that after drinking two bottles of brandy, and smoking an ounce of tobacco, with occasional relays of “devilled” kidneys, they, without ever going to bed, should hunt all day, the best “stayer” to win. The colonel distanced all his competitors with the exception of a Mr. O’Rielly. The performance commenced on a Monday; on the Sunday morning following, when he walked into the kitchen, the colonel was amazed to see his opponent dancing with the chambermaid; he at once “threw up the sponge,” and, no doubt, spoke truly when he said, “I never met a man before who could drink six nights, hunt six days, and then enjoy an Irish jig with Betty.” To connect us, perhaps, with the great past, a club, founded on the lines of the Benson’s, still exists and flourishes-The Down Hunt assembles yearly for convivial purposes; and as there are no hounds, and the membership of the very exclusive body entails no qualifications in horsemanship, the memories of old days, when many of the body followed The Lord Charlemont to Dungannon, and the pictures of long since dead members in the quaint uniform of the club, are the only connecting links with the time when sport was its raison d’etre. The election to the privilege of wearing the drab dress coat and gold button, is an honour very eagerly sought by Ulster gentlemen; and the man who emerges unscathed from the annual week’s long symposia, will have proved his claim to membership of any convivial body in dear Ireland or elsewhere. In 1808, field-money was first paid in Kildare, the sum charged being 1s. 8d. On the 6th of April, 1808, a resolution was passed that the full dress uniform should be, blue coat, buff waistcoat. It may interest some to know who were the most liberal subscribers to the fund in those days. In 1825 these were-The Duke of Leinster, £50; Lord W. Fitzgerald, £28 8s. 9d; Robert La Touche, £50; H. Carroll, £50; Lord Mayo £20; W. H. Carter, £22 15s. ; Colonel Loftus, £11 7s. 6d. ; John H. Mayle, and Robert Saunders, £22 15s. In 1841, Sir John Kennedy resigned, after a reign of much longer duration than any of his successors have enjoyed. He was succeeded by Mr. John La Touche, of Harristown. His term of office extends over five seasons, during which time his great efforts to show sport, and turn out everything in the best style were eminently successful. He was a very general favourite, and he, and his brothers, Robert and William, were brilliant horsemen. Mr. La Touche, who is an exceptionally good judge of horses, kept a splendid stud of hunters. He usually drove a drag, perfect in its appointments, to the different meets; few more expert “whips” ever sat on a coach-box. He was well versed in stud lore too, and no man living took greater interest in the canine alliances than his brother William. “Jem” Byrne, afterwards “master of the horse” to Captain Sheddon, who has these many years been a consistent and liberal supporter of the Kildares, who had been for many seasons whip to Sir John Kennedy, hunted the hounds for some time after Mr. La Touche took them; subsequently Mr. La Touche carried the horn himself. The next master was the late Mr. David O’Connor Henchy, of Stonebrook, Ballymore-Eustace; he took office in 1846. He, too, was a great man in the saddle, and an ardent supporter of the turf and of hunting. His own colours, blue and pink, were sometimes worn; but old “Dame Fortune,” like other dames, is fickle, and she was not generous in her recognitions of his high claims to favourable treatment at her hands. He shared the racing fortunes for a short time of his brother-in-law, Sir Thomas Burke, who was one of the “pillars” of the Irish turf. He discharged the onerous duties appertaining to the post of master of foxhounds to the entire satisfaction of all interested in the welfare of the “Kildares.” Although he had them during that awful period when gaunt famine desolated our country, and escorted death through the lonely plains of our land,-I need scarcely say that he had much difficulty in hunting the country during such a time-“the sinews of war,” the coin of the realm, were sadly wanting, and the exchequer of the Club was in a lamentable state of deficiency. During the year 1847 he was the uncomplaining loser of £475. He resigned at the close of the season 1847-8. Strange to say, the members of the members of the Hunt do not appear to have appreciated his strenuous exertions in a good cause. One would think that they would have presented him with a testimonial, for no man more fully deserved a substantial recognition from the lovers of the “noble science” than he did. Soon after his retirement, however, the people of the county testified their kindly regard for him, and confidence in his worth by returning him as their representative in the House of Commons, although he was opposed in the election by one of the most esteemed men of Kildare. He sat for the county from 1852 till 1859, and died on the 1st of December, 1876. I should have stated that Sir Edward Kennedy was appointed Hon. Secretary to the Hunt Club in 1844. Mr. La Touche received £300 per annum for keeping the horses, hounds, &c., and about double the sum was given to Sir Edward to defray the expenses of keeping the coverts, paying for reynard’s depredation on fowls-in a word, for keeping the country. Mr. J. Kilbee was secretary before Sir Edward took the post. He and all his predecessors were paid officials. The successor of Mr. O’Connor Henchy, was Mr. William Kennedy, Sir John’s second son; he was at that time, a “crack” Corinthian rider; and in the hunting-field, then, as now, his motto would seem to be that of the old maid relative to her female domestics, “no followers allowed.” When the scent and run are good, he may often be seen amongst the leading lot. The late Lord Cloncurry (then Hon. E. Lawless) was a “first flight” man too. Mr. Edward J. Beauman, who resides at Furness, Naas, may be put down in the same class, as well as Mr. P. Lattin Mansfield, of Morristown Lattin, who now comes out very seldom; and the late Mr. T. De Burgh, of Oldtown, Naas, deserves mention. A very good huntsman served under Mr. O’Connor Henchy,-Blackhouse, an Englishman, and a great rider. Mr. Kennedy hunted the hounds himself, with Stephen Goodall as first whip: Mr. Kennedy was replaced in 1852 by a very worthy sportsman, John Henry Scott, third Earl of Clonmel, who was distinguished for his bon hommie and sportsman-like qualities. He never was a very good horseman though a most ardent huntsman was beloved by his tenantry, and possessed a character of such patent amiability that persons pf all creeds and classes united to make his reign as M.F.H. one of the most eventful ever enjoyed. He was succeeded, in 1857, by the late Lord Mayo (then Lord Naas), who was assisted by one of the best huntsmen that ever carried a horn-Stephen Goodall. Stephen had been in office under the Bishopscourt dynasty, and he enjoyed and deserved a fame in Irish annals such as was only paralleled by his brother Will, then of the Belvoir. He showed grand sport, was a keen sportsman, and by procuring drafts from the Belvoir, Foljambe, and Brocklesly blood, improved the pack a good deal. During his time, too, the country was benefited by the addition of several coverts-they were mostly natural pieces of gorse-and the members of the Hunt Club subscribed to have them enclosed, &c. His lordship rode fully seventeen stone, yet he often held a good place amongst the leading brigade throughout a good run-of course he was always well mounted, and was a first-rate judge in equine matters; indeed, I may say of stock of every description. When Lord Mayo accepted the mastership the funds were very deficient. At a meeting held on the 4th of May, 1857, it was found the estimated expenditure for the coming season, £1,659, would far exceed the money in hand, as there was only a sum of £900 from subscriptions, and £259 of field-money. Before the end of Lord Mayo’s first season the funds had risen to £1,450, and the field-money was nearly doubled, and the subscriptions increased so considerable as to warrant the expenditure being fixed at £1,900 a year. The “Kildares” had two extraordinary runs during Lord Mayo’s reign-one was from Laragh, in November, 1859. the fox was killed, after a run of over two hours’ duration, near Swainstown, I the county Meath: the distance from point to point was nineteen miles by the ordnance map. Goodall was the only man who rode over he last fence; he stated that he never rode over such a grand country, and that for the last hour he never crossed over a ploughed field. The second memorable run was from Baltiboys, near Ballymore-Eustace, to Mr. Walshe’s, of Belgard, six miles from Dublin, where the hounds were left hunting their fox in the dark. They must have gone over twenty miles. Lord Mayo took a great interest in the Irish turf, and did more than a little for its welfare. He raced a few horses, but I think his yellow and crimson jacket was borne but once successfully, that was when, in 1862, he won the Kildare Hunt Cup with Hornpipe. The last time it was seen on a racecourse was at the Curragh October meeting 1868, when he raced a filly called Purity for a Selling Stakes, which was won by Kate Kearney. Purity fell, and gave her pilot a bad fall. Jam Doucie rode her, and I think I am correct in stating that this was his maiden race. Lord Mayo was the founder of the Palmerstown Association, and had he been spared, it would, probably, be in a flourishing condition now; and during its existence, it tended to improve the breed of thoroughbred houses in Ireland very materially, and many good ones first saw the light within the Palmesrtown paddocks. His lordship’s character as a statesman is so well known that I need not dwell on his wonderful ability. He sat for Kildare from 1847 till 1852; for Coleraine, from ’52-’57; and subsequently for Cockermouth, a borough in the patronage of Lord Leconfield, whose daughter he married in 1848. He was Chief Secretary for Ireland for several years, and was, in 1868, appointed Governor-General of India, and there, in 1872, he was basely assassinated in his 30th year. Although his politics were not those shared by the great majority of his countrymen, Lord Mayo had won and deserved the respect of all classes. His manly, straightforward conduct even to his opponents, won the regard of the bitterest of them; and a certain strong-handed policy, very intelligible, even if directed in unpopular channels, never alienated the affections of the many admirers who, knowing Lord Mayo, were forced to be proud of him as an Irishman and sportsman. Those who have passed along the high road from Dublin to Naas, must have noticed Johnstown, a charming neat little hamlet, which seems to nestle under the protecting woods of Palmerstown. It seems but yesterday since his lordship, on the beau-ideal of a weight-carrier, dressed in his ample pink, with the master’s hunting horn at his saddle-tree, surrounded by those canine pets whose music he loved so well, stood in the village at the entrance gate to his demesne, and received-on November’s first Tuesday-the cordial greeting of brave men and fair ladies, come to participate in the pleasures of the chase with him; and now a few yards further down, “The Mayo Arms” stands, and opposite to it a little grave-yard; in its centre a ruin, clad with clinging ivy; and within its walls a plain Wicklow granite cross marks the grave of the late Lord Mayo. He was succeeded as master in 1862, by Baron de Robeck, of Gowran-Grange, Naas. It is no exaggeration to say that few better men to hounds ever rode over the plains of Kildare. Hogg was promoted to be huntsman by Lord Mayo, and a great mistake it was on his lordship’s part, for a worse huntsman never handled hounds in the country; and I believe the only hounds he hunted after he left Kildare were the hounds at Rome, so his services were not appreciated in England or Ireland; he was huntsman for a short time to the Baron, and then Richard Lyons, who had been first whip, was promoted to be huntsman. The sport shown by Baron de Robeck during his regime will bear comparison with any of his predecessors; and on his retiring after six years’ service, hunting men of all classes in the county subscribed a slight token of their gratefulness to him for the satisfaction he gave during his term of office. The next master was Sir Edward Kennedy, Bart. the family is one of the oldest in Leinster, and Sir Edward’s ancestors were all noted for their devotion to the sports of the field. As I stated before, his father may be called the founder of the Kildare Hunt Club; and that his father and grandfather kept hounds, is proved by the fact that both bequeathed a legacy to their huntsmen in their last will and testament. There are now some old silver buttons in Johnstown-Kennedy which adorned the costume of those huntsmen; and it is evident that they used to hunt foxes, as the figure of a fox and the words “Johnstown-Kennedy Hunt” are engraved on them. Sir Edward Kennedy, or to be more exact, Charles Edward Bayly Kennedy (Unit. Kigd., 1838), eldest son of Sir John, first Bart., and his wife, Maria, daughter of Edward Beauman, of Rutland-square, Dublin, born on the 13th of Febraury, 1820, succeeded his father, 13th of October 1848, and was educated at Eton. That he had inherited the ardent love for the “noble science,” which appears to have been transmitted from sire to son through many generations of Kennedys, soon became apparent. Indeed it was only natural instinct that led him to embrace the sport so keenly, and study venery in its minutest details. He was only 23 years of age, when he became Honorary Secretary to the Kildare Hunt Club. He discharged the duties which devolved upon him as such in the most satisfactory manner; and to do so required a great deal of tact, a knowledge of the country, and, above all, popularity amongst all classes. The latter enviable distinction appears to be a sort of heir-loom to the family; and it has become a kind of proverb in Kildare that “there never was a bad Kennedy.” Sir Edward is a most indulgent landlord, and that he understands agriculture, and takes an interest in it is proved by the fact that Johnstown-Kennedy presents all the appearances of a “model farm.” Being a sportsman “to the manner born,” and residing in a country where the chimes of the paddock-hill are heard almost as frequently as the melody of hound music, it is not surprising that he entertained a penchant for the sport happily styled national; and we find his colours, “green, pink sleeves, and black cap,” registered in Mr. Justice Hunter’s “Calender” of 1853, for the first time; but they had been “sported” a few times previous to that year. In ’53 the first Corinthian Cup was run for in Punchestown, and Sir Edward rode a mare of his own for it, named Concetta. She was a small hunter, and the Baronet was “chaffed” a good deal as to his chances of success, and he consequently backed the mare for a good deal of money, to beat more than would beat her; and she did, for she finished fourth out of eighteen runners. At the Curragh June meeting that same year he rode his own horse, Collier, for the Corinthians. There was a long price to be had about him, as Mr. Wm. Kennedy’s Brother to Russborough, afterwards called Cruisk, ridden by Major Bell, were backed for a great deal of money. The first heat terminated in a half-length victory for April Fool, after a great finish with Collier, but Brother to Russborough won the second and final heat easily. The last time Sir Edward rode was for a Corinthians at the Curragh September meeting following. It was a great race, and came off on the same afternoon that Tom, ridden by J. Osborne, defeated Ariadne, Bacchus, Gamekeeper, Junanita, Purez, and other good horses for the Angleseys. Sir Edward Kennedy rode May-day, a filly by Harkaway, the property of Mr. Orford, of Suncroft; his opponents were Lord Waterford’s Lambay (Major Bell), Mr. Wm. Kennedy’s Nee-shay-wooshin (I wish there was a nag of that name now, what a jawbreaker it would be to the book-makers) (owner), Mr. J. Balfe’s Royalty (Major St. John), and Mr. Courtenay’s Gay Lad (Capt. Pretyman). Odds were laid on Lambay for the first heat, but Nee-Shay-wooshin won easily. In the next heat he was better off, and a tremendous “set-to” between Lambay and May-day ended in Sir Edward’s favour by a head; in the next day the result was exactly the same. I think it was that same year he rode in two races at Howth, which, from their novelty caused quite a sensation. One was a race ridden from their novelty caused quite a sensation. One was a race ridden by gentlemen in bonnets: it was very amusing, especially so to the ladies, I am sure; but the riders were quizzed so unmercifully that they did not enjoy it at all. Some of the bonnets were beauties. One gentleman, Major Paynter, of the Guards, who was one of the handsomest men in the service, went to Russell’s and ordered a very expensive bonnet; when he tried it on, however, he said it did not become him at all, and gave orders to have another made; it did not please him either, and he had five made before he was satisfied, or rather he took the fifth, having at length come to the conclusion that no bonnet would become him. Lord Howth sported his own colours, black and white, as he wore a widow’s cap; and Sir Edward Kennedy had a fox’s brush sewn on to the front of the bonnet. The conditions of the other race were that each rider should light a cigar at the post, and if it was out when he came to weigh in he was disqualified. When Sir Edward Kennedy took the hounds the pack consisted of fifty-two couple, mostly bred from the Belvoir and Brocklesly kennels. Sir Edward, finding them mute, and also, as he said, that “they would race a fox, but not hunt him,” he, with great success, introduced new blood, chiefly from the Holderness and York and Ainsty kennels; and the present pack, although quite as fast as ever, hunt to perfection. Richard Lyons came from Gowran-Grange (Baron de Robeck’s) with the hounds to Johnstown-Kennedy, and was Sir Edward’s first huntsman; William Brice was first-whip, and Charley Brindley, who came from the Quorn, and who died a few years ago, was second. When Brice left, Brindley was promoted to his place, and Will Freeman, who came from the Pytchley, was second. Brindley having left with Lyons the huntsman, Freeman got first-whip place, and Tom Mc Alister second. Sir Edward’s first move was to expend a large sum of money on the coverts; no doubt he had a wide field for his labours, and Kildare sportsmen owe him a debt for his arduous and most successful exertions to improve the fox haunts. He was obliged to resow Arthurstown, Hortlands, and Cappagh, and three-fourths of Castle-Bagot, Downshire, Eadestown, Stonebrook, and Rathcoffey; and the following coverts were quite gone-Moorhill, Killashee, Three-Castles, the Curragh, and I believe, one or two others. He expended a great deal of his own money on them, and made many of them perfect. At the end of the season 1869-70, Richard Lyons went to England, and he was replaced by Richard Scarth, who hunted them for three years, and, like his predecessor, gave every satisfaction. Rees succeeded Scarth, and hunted the pack for part of Sir Edward’s last season. An accident in the hunting-field prevented him from carrying the horn for a long period. Sir Edward’s very nature was imbued with a love for fox-hunting, but he has not hunted since he ceased to be an M.F.H. When he was obliged to hunt the pack himself, as was the case a few times owing to the illness of his servants, he got on well. As a judge of hounds he was quite first-rate, and he knew the schoolmasters and mistresses of his pack-in fact, the character of every hound he had. Mr. Edmund A. Mansfield was next M.K.F.H. When I state that he is one of the Morristown-Lattin family, I need scarcely add that he is a very general favourite; his many good qualities won golden opinions for him. He possesses an amiable and quiet manner, but by the way he always controlled the impetuous and heterogenous assemblage which makes up the Kildare “field,” he proved that the suaviter in modo is often preferable to the fortiter in re. During the time he held the reins of manager he gave a very great satisfaction, and the sport was very good indeed. Will Freeman was made huntsman when the hounds came into Mr. Mansfield’s possession. He has now been seven years in the county as hunt-servant. He had the great advantage of serving under the best gentleman huntsman of the day as whip, Capt. Thompson, when he carried the Pytchley Horn. He knows every inch of the Kildare territory, rides well, has a splendid voice; and as the hounds always look well, it is apparent that he knows his business in the kennel as well as in the field. Two years ago public kennels were erected at Jigginstown, one mile from Naas. They may be described as being “neat but not gaudy,” and they are very commodious. Builders are at present at work there erecting stables and other accommodation, and when complete it will be a very excellent establishment on a very central position. Mr. William Forbes, the present master, is a native of Scotland; his home in the Highlands is near a village known to tourists who have travelled to the Trossachs via Callendar. But he is well known in Kildare, where he has resided during the hunting season for several years past. That he loved the “mimic warfare” is proved by the fact that he hunts six days a week, although he often has a very long journey to the trysts. He is a supporter of steeplechasing too; though he seldom races his horses anywhere except in Punchestown, where he won the Prince of Wales’ Plate in 1871, with Huntsman, and was second with Delight. In the year following, the French bred, Heraut d’Armes, made a grand debut as a chaser, by winning the Conyngman Cup, ridden by Capt. Smith, beating Curragh Ranger, Bashful, and several other good horses; Gaskill and Kingswood also carried the dark-blue jacket successfully over this course. Mr. Forbes never bets, but races for honour and glory. He is very wealthy, and will, I am sure, turn out the hunt servants in A-1 style. The county will be managed by a committee of three, who will be allowed £1,200 per annum. They are Major the Hon. E. Lawless, Baron de Robeck, and Mr. Fortescue Y. Tynte, three popular sportsmen, who will do everything in their power to please all parties. I may add that they are first-rate men to ride a hunt. Mr. Forbes will be allowed £1,000 a year. Formerly the hounds used to meet three days a week; during Sir. Edward’s time they met seven days a fortnight, and the custom has continued up to the present. Next year they will hunt four days a week. The hounds were Sir John Kennedy’s own property, and he made them a present to Mr. La Touche, since which time they became the property of the hunt. The last five being rented coverts. When Sir John Kennedy resigned, he left forty-nine coverts. There are now in the Kildare hunting district sixty-one gorse coverts and twenty-five woods or demesnes which are drawn and in which foxes are found. Some say hounds are much faster now than formerly. It may be so. But one thing is certain, so far as the hunting in Kildare proves, that more foxes were killed formerly than at present, considering the number of days hounds were out. No doubt, as draining was little known, there were fewer foxes run to ground. The following table will prove this. Taking two years during Sir John Kennedy’s time, from November to April, and two in Sir John Kennedy’s, the following may be interesting. “Season.”Days out. Finds. Killed. To ground. Sir John Kennedy attributes the cause of so few foxes being killed in the six years he was master to the fact, that only seven cubs were killed during the six years, the rest being old foxes. Few cubs having been found, as traps were set for rabbits all over the county, and cubs were caught, they not being as clever as the old foxes to escape the mischief. It may interest some to know how the subscription has increased, and also the field money; it would be useless to mention every time that a change occurred, so I have selected three years. During Mr. Mansfield’s mastership, Freeman’s lieutenants were W. Rawle and Charles Peck; at the end of the season,76-7, the former was replaced by Tom Mc Alister, who was second whip for a time during Sir. Edward Kennedy’s reign, and who then went as first whip to the Queen’s County hounds, where he remained until his return to this county. The annual subscription paid to the master for some years past has been £2,100, out of which he had to pay the expenses of the country. This amount was made up by subscriptions, donations (given by the military quartered in the district and civilians not members of the hunt), and field money. Last season, 76-7, there was a considerable surplus, the subscriptions being larger than usual, and the field money having been larger than was ever received before. Hitherto the master has had exclusive charge of the country, directing everything, and paying all charges in reference to it. From 1st May, 1877, as already mentioned this has been changed. The hunt numbered in 1876-7, one hundred and thirty-eight members paying subscriptions of from £100 to £5 a year. The expenditure on the kennels, stables, and house for the hunt servants amounted to between £3,000 and £3,500. previous to the building of the present kennels the hunt establishment was kept at the private residence of the master, who was always a gentleman of the country, living and having extensive premises in a central position; and to that class the selections of masters had necessarily been restricted. For the future the hunt will not be subject to any such restrictions, and will be free from the embarrassment to which, on several occasions upon the occurrence of vacancies of mastership, it has led. The admission of members to the hunt is by ballot. The first meet is held annually on the first Tuesday in November at Johnstown Inn, and on that evening the members dine together at the Royal Hotel, Naas, which is considered the head-quarters of the hunt; and they give a ball each year, generally in the month of January. Mr. David Mahony, of Grange-Con, Athy, has for some years past acted as honorary secretary, and this esteemed sportsman is a very able Chancellor of the Exchequer. Several gentlemen subscribe very liberally to the fund. His Royal Highness, the Duke of Connaught, is an honorary member of the hunt, and a very liberal subscriber. The popular soldier prince frequently honoured the meets with his presence last season. He rides remarkably well, and is, undoubtedly, a first-rate all-round sportsman; his many estimable qualities have earned for him a deserved and widespread popularity. Kildare is, undoubtedly, a fine hunting country. The “territory” is at least forty miles long and twenty miles wide, including within the bounds a considerable portion of Wicklow and Dublin, many favourite fox haunts are situated in close proximity to the “land of brown heath and shaggy wood,” the Wicklow mountains-but the highlands over which we often follow the “pied beauties” are quite rideable though nags who have “joined the band,” no matter how slightly endowed with musical propensities, find it often impossible to live with them in these hilly hunting grounds. Over the hills in the neighbourhood of Tinode, Coolemine, and Groucher’s Gorse, all favourite resorts of the fox family, hounds generally carry a good head. If your horse is clear in the pipes, and clever enough to negotiate safely the high, rotten banks frequently met with in these parts, there is no reason why one shouldn’t be with hounds, as the going is good. The “cream” of these truly happy hunting grounds is the neighbourhood of Punchestown, Kilteel, Dunlavin, Ballytore, Maynooth and Kilcock. There is nothing to stop a good man, well mounted, in this fine grass country, where the fences are safe and sound, albeit “stiffish.” There is just enough woodland to be pleasant in Kildare, the many coverts are nicely situated, and foxes sufficiently numerous. Feathered game preservers are almost unknown. A few years ago rabbit trapping was carried on to such an extent that fears were entertained that foxes would be entirely exterminated out of certain districts. But the then master, Sir Edward Kennedy, drew attention to the fact, that the foxes were so often destroyed by the trappers, that something should be done to prevent the obnoxious custom. A meeting of supporters of fox-hunting was held, and several gentlemen who were in the habit of having traps set for the destruction of poor “bunny,” when they were assured of the amount of injury done towards the fox-hunting portion of the community, in the most sportsmanlike way promised not to allow trapping to be carried on; and, I think that but little injury is inflicted in this way now. There are more resident gentry in this country than in any other in Ireland, and a vast majority of them are fox-hunters. For some years past a growing evil has caused serious apprehension amongst hunting men; I allude to the erection of wire. In some districts it is quite impossible to ride to hounds, owing to this objectionable pride. The landed proprietors (for I am sorry to say they set the bad example) and farmers do not use wire for the purpose of interfering in any way with the hunting. The great majority of them are delighted to see the hounds in their neighbourhood, and many of them are hunting men. Economy is their motive; I certainly think their notions on that score are very mistaken ones. No doubt wire is easily out up, but I opine that the posts become quite rotten after about four years, and, on account of the frequent repairs required, I am convinced that making wire fences is, generally speaking, a penny wise, pound foolish proceeding. Horses, sheep, and cattle are frequently severely injured by being caught in wire. It would be labour in vain on my part were I to write at length, pointing out the manifold advantages derived by all classes, the tenant farmers particularly, by hunting. Any injury done to their lands is truly insignificant in comparison to the advantages they derive, notably from the increased value of horses, oats, hay, and straw. And the fact must be so perfectly apparent to all that I need not, though I could very readily, point out the benefit derived from this pastime of princes-the most glorious of all amusements. Absenteeism is the cause of many evils, to it may be attributed a great deal of the poverty of our countrymen; and were it not for hunting, those who spend the most money amongst us would migrate to foreign lands. Hunting affords pleasure, is a healthful recreation which keeps at home in our country the flower of the Irish aristocracy, yields wealth to willing hands, cements good fellowship, puts money into the pockets of the landed proprietors (by increasing the value of their property), tillers of the soil, the shopkeeper, the artisan, the peasant, in a word, the entire population. I happen to know three very wealthy sportsmen, who intended coming to reside in this country last season for the winter months, but seeing so much of the country wired, they changed their mind. These were men with plenty of means and large studs, who would have spent a great deal of money here. I sincerely hope that the landed proprietors who have wire fences on their land will remove them, and I am sure many farmers will follow the example of a wake so stimulative, and “go and do likewise” before they cause further injury to their own interests. I believe that love of sport of all kinds, as well as of foxhunting, is inherent to the nature of every Patlander; and I hope that those Kildare men, whose occupation is the patriotic one of making “two blades of grass grow where one grew before” will support foxhunting. If they “ ‘ware wire” the day will never come-not even on the arrival of the long-expected New Zealander on London Bridge-when the gorse is uprooted, and the cry of the foxhound no longer heard within the bounds of “fair Kildare.” Fences of all sorts and sizes are to be met with in this country. In places where wire is not used you can go sailing away if your heart is in the right place, and you are well mounted. Walls or timber you seldom meet; but to be a safe conveyance, your horse must be a “tip-top” bank jumper, and a bold fencer. The number who comprise the “field” average about 150, including many who would be regarded as first-flight men in any age or in any country. I have given in my reminiscences of other hunts the names of those who comprised the leading brigade in the days of “auld lang syne,” as well as those of the present. But in this instance I will not presume to make selections, there are so many worthy of honourable mention, that I could scarcely make up my mind as to who are deserving of being included in the schedule. Although I have had very many good days hunting with these grand hounds, and ample opportunity of seeing, and, I may add, did see them often race, “head up and sterns down,” when in the front rank were gathered the “good and the true ones.” The field, too, invariably includes visitors from Meath, Dublin, Queen’s County, and an occasional pleasure seeker from the Shires, and other “birds of passage,” such as officers of the Dublin and Newbridge Garrison. The thought may strike some that I might mention a few of the flyers who have ere now gone to ground without fear of giving offence. I thought of doing so, but I have not yet lived to comb a grey hair, my “tatch” is unstained by those silvery indications of the flight of youthful days, so my recollection does not extend very far back, and I will not add to the few I have already particularised. Several of the best men of the present day are named the “Men of Kildare,” which I may add was composed by me after a good run with the Kildares in 1876. Tho’ fortune prove fickle they never despair. How you ride to our hounds when you come to Kildare. An extract from "Irish Sport and Sportmen" by B.M. Fitzpatrick, published in 1878 describing the history and customs of the "Killing Kildares." WATERFORD MUSEUM OF TREASURES - Summer update! Waterford Museum of Treasures is housed in a splendidly restored granary, located in the heart of Waterford city on the Quay. It is an interactive journey through a thousand years of history of Ireland’s oldest city Waterford, from its earliest Viking origins to the present. The Museum celebrates the ethnic, cultural and religious diversity of all who contributed to the making of Waterford. A tour of the Museum takes about 50 minutes (approx.) and we offer both guided tours for groups or you can take your own sound-guide, where you can to the tour at your own pace. On site facilities also include a superb Gift/Souvenir Shop, On-site silversmith, (who makes beautiful jewellery), Tourist Information Office and a Full Restaurant/Coffee shop. As a special introductory offer, we would like to offer your association/society a very special rate of just €4.00 per person. As an added extra, for the summer months, Waterford Museum of Treasures is taking a trip down memory lane with an exhibition running from right now until the 20th of August that charts the phenomenon that was the showbands era in the 1950’s, 60’s and 70’s. This exhibition called “Hucklebuck Time”-a celebration of the Generation that danced its way into history, can be seen in our exhibition area. Admission to this exhibition is included in our very special offer to your association, but if you would just like to visit the exhibition only, the charge is €3.00. We have also secured a very special rate for Golden years/Retirement Groups with the Tower Hotel, which is located in the heart of Waterford city, overlooking the Marina. The hotel features 135 en-suite bedrooms, full leisure centre, restaurant, bar and private hotel car park. The hotel is within walking distance of the main shopping district and the Waterford Museum of Treasures. Rates are valid Sunday-Thursday inclusive and are subject to availability. Details of Summer events and offers at the Waterford Museum of Treasures, from Ann Mc Greal, Sales and Marketing Executive.